Here I am, sitting in my twirly chair waving to all four corners of the globe with my own mini challenge work in progress report. This week I started working on the large outer wrap of the sewing caddy hussif. It is enjoyable to settle to larger piece after working the the fiddly pockets. I have started to embroider a few sections but as yet have not added beads to them. To be honest I managed only a small bit of stitching this week as I am working on writing a book and my head has been La-La book land and its turned my brain to mush. Now I know talking about LA-LA book mush brain is probably not a good thing write about when describing writing a book but that is the truth of it. Anyway here I am sharing my stitching progress as promised and I hope folks find watching the process interesting. The branch of flowers is created by using a perle #5 cotton in up and down feather buttonhole which was a Take a Stitch Tuesday (TAST) challenge stitch. Follow the link if you want to know how to work it. The roses are created in hand dyed variegated perle # 5 cotton using another TAST stitch called Raised Cross stitch flower. These are quick effective and easy to do. The next little motif is a spray. I marked out the stems using my Crazy Quilting Templates and then stitched the lines in stem stitch. 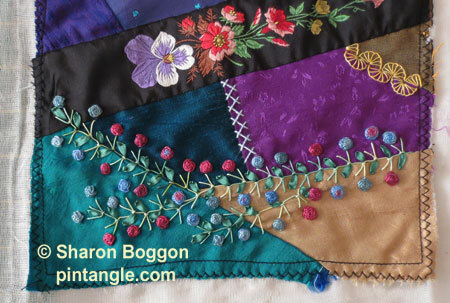 The silk ribbon flowers and leafs are both created in leaf stitch. They need to have beads added yet. I always work most of my embroidery first then add the beads later otherwise I have the constant frustration of catching my working thread on beads and buttons! It means things always look half done until the end when there is a flourish of beading and its done! I love seeing everyone’s progress. I should get back to my own CQ soon. I did finish a block for my CQ group’s round robin. Marcia pieced the block and asked for a “flora and fauna” theme. You are a busy woman, Sharon, gorgeous colors. I managed to finish a sewing bag, here, http://crazyvictoriana.blogspot.com/ . Remember to enjoy something beautiful ! Sharon it IS interesting to see how your hussif is progressing and also it reminds me of stitches I forget to do, The Raised Cross stitch flower is one of them. I haven’t done anything lately on my hussif as I goofed with the inner and outer size. The first was made at home, the outer at my DD’s place where I guessed the size needed and later found it is narrower than it should be. I’m almost caught up with my projects and hope to get back to the hussif next week. 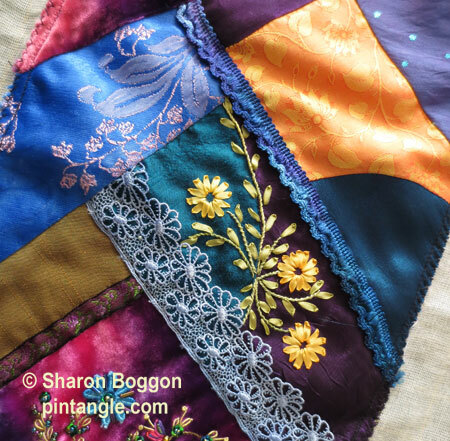 Ooooh, some very pretty trims there, Sharon! I have made progress on my Elizabeth but am up to my ears in veggies and fruit!!! If I can, I will post a picture of my progress. Love what you have done so far. I want to start a new project that is surface embroidery but I must finish something first! We all want you to stay in LA LA book mush land as long as it takes, Sharon. Sharon, your work is gorgeous! I made a bit more progress on my Winter/Christmas Wall Quilt. Lot’s of progress here! I like the up and down buttonhole with the flowers. I totally forgot about the raised cross stitch, it produces such lovely flowers. Thanks for the reminder! I really like the curvy lines on you spray; those stencils really are useful! More thinking than stitching this week. I have posted on my blog. This coming week looks a bit crowded as well. Carolyn, I was unable to comment on your blog. I just wanted to say your TAST sampler should make a beautiful bag! I hope your kids are feeling better.